Single Roll Toilet Tissue Dispenser - 5.25" Roll Dia. 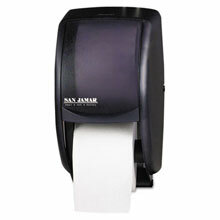 Single Roll Toilet Tissue Dispenser - Satin Finish - 5.25" Roll Dia. Single Roll Toilet Tissue Dispenser - Bright Finish - 5.25" Roll Dia. Single Roll Toilet Tissue Dispenser - 6" Roll Dia. 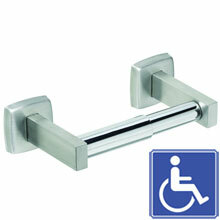 Dual Roll Toilet Tissue Dispenser - Surface Mounted - 5.25" Roll Dia. Dual Roll Toilet Tissue Dispenser - Bright Finish - 5.25" Roll Dia. 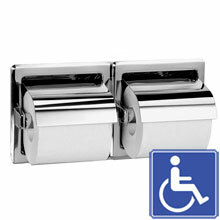 Dual Roll Toilet Tissue Dispenser - Satin Finish - 5.25" Roll Dia. Dual Roll Toilet Tissue Dispenser - Surface Mounted - 6" Roll Dia. Dual Roll Toilet Tissue Dispenser w/ 18" Shelf - 5.25" Roll Dia. Duett Toilet Paper Dispenser - Black Pearl - 5.5" Roll Dia. Toilet Paper/Tissue Dispensers for commercial restrooms and bathrooms. UnoClean offers everything from single-roll, dual-roll, to even jumbo roll toilet paper dispensers that can provide non-controlled delivery and controlled delivery of toilet paper/tissue.